It was good, at least as far as a) Star Trek films and b) silly summer popcorn films are concerned. It was fun, and I didn’t feel like I’d mis-spent my money or gotten ripped-off: I was entertained for two hours, which is what I expect for my (bargain matinee) dollars. But, I wondered, was it Star Trek? Let me say, right up front, that I’m not a die-hard Trekker (as the pros prefer to be called). I’m a trekkie, raised watching reruns before dinner on weeknights as a kid. So, far from being horrified, I thought the 2009 Star Trek reboot, while not without its flaws, was an interesting take on the franchise. Moreover, I thought the writers created a novel way of resetting things in an alternate timeline that didn’t, by virtue of its existence, negate everything that happened in 10 movies and five television series that have aired since 1966. To my way of thinking, there’s nothing wrong with a little rebooting and re-imagining now and then. After all, Hamlet is a classic, but I don’t see people throwing a fit when the play is re-told in modern ways or getting into a snit because the original actor who played Hamlet is no longer doing so (‘cuz, you know, he’s most likely passed on by now and all). So on the one hand, I enjoyed Into Darkness, but on the other, I find it to be a deeply flawed extension of the Star Trek franchise. Matthew Yglesias, in his piece “I Boldly Went Where Every Star Trek Movie and TV Show Has Gone Before“, wrote eloquently last week about how Star Trek is better served on the small screen and his hopes that it will return there. I agree with his assessment, but I still think that Into Darkness could have been a better film if only it had both listened a little more, and a little less, to the history of Star Trek. Just look at that cover price! Combining the most varied in drama-action-adventure with complete production practicality. And with almost limitless story potential. 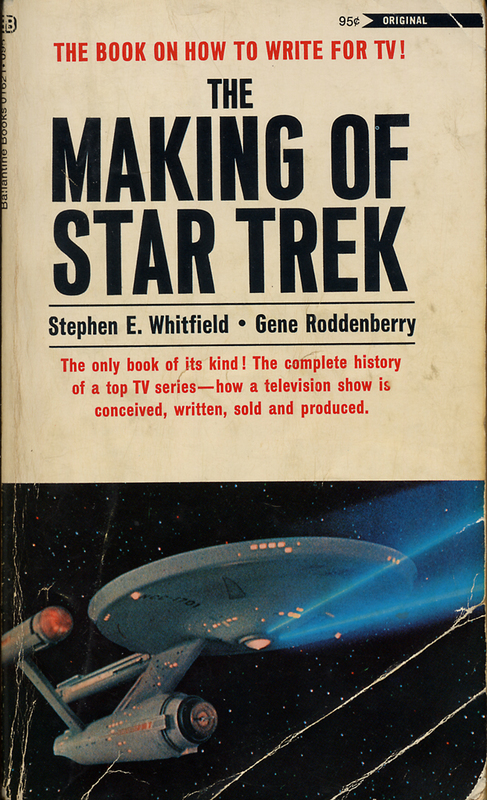 Right from the start, we can see one essential fact: Star Trek was designed as a TV series, not as a motion picture enterprise (if you’ll pardon the pun). Why is Star Trek on the big screen at all? 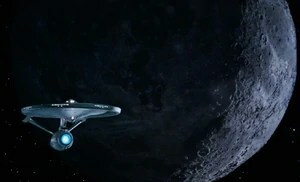 It wasn’t really intended to be: in the late 70’s, Star Trek was slated to return to the small screen as Star Trek, Phase II, which Paramount would air on its new fourth network. The cast was (mostly) in, ships and sets were being designed and built, the whole thing was good to go until the new network deal failed… and then Star Wars came out. Star Wars shook the industry. And, in traditional Hollywood practice, the studios decided that what people really, really want (and will pay for) isn’t something new and different (which, of course, is exactly what Star Wars was at the time), but more of exactly the same. So, every studio in Hollywood looked for all the sci-fi product they could find, and Paramount had Star Trek already ready to go. With Star Wars blowing away box office records like so many Death Stars, it was inevitable that Star Trek would be pushed to the big screen. Today, Paramount is in something of the same boat, looking for a genre product that seems to be in demand. 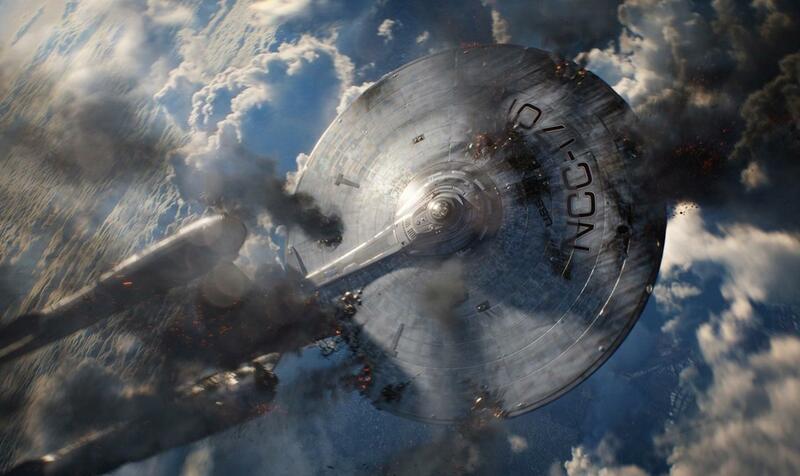 Lacking properties like the Marvel or DC cannon as part of the current glut of superhero flicks, Star Trek can’t just break even for the studio. It has to make a profit, be successful to a wide audience, and continue the franchise. It’s that need that drove them to take an existing property (with an existing fan base) and allow Abrams and crew to restart the franchise in 2009. On balance, both creatively and economically, they managed to do so. So, where does all this leave me as I ponder Into Darkness? Mostly feeling that there were a lot of missed opportunities, sacrificed at the altar of summer event picture. Part of the problem is that, given that Abrams et al have elected to re-start the Trek franchise in an alternate universe, it strikes me as a little odd that they would pull so much from what already exists, from characters to scenes to lines of dialog. Watching Star Trek II: The Wrath of Khan beforehand should practically be required. In the end, between the repeated characters and dialog, it all started to seem a bit pandering, as though someone went through the script putting in as many Trek references as possible to “get in good” with the core fan base. The bigger problem I found is that the filmmakers rather blow some exceedingly interesting opportunities with the plot. What might have been an interesting espionage/political intrigue tale, one in which the direction of the early United Federation of Planets and Starfleet are torn between being, at their core, military or exploratory organizations, is tossed out the window in favor of action, action, action. Imagine that alternate plot, one which involves subterfuge, the discovery of rogue elements, and manipulations of power (starships, after all, being pretty powerful military vessels to have control of). Such a plot could have involved deep, interesting mysteries, plot twists, perhaps even story turns that would have taken the Enterprise crew to various new planets and cultures in pursuit of both truth and morality. Wait a minute… that sounds like a story that could also be a commentary on the extent and intentions of modern day politics, economics, governments, militaries, etc.! Wow, that might be some interesting territory to explore, right? Nah. Let’s spend the second half of the movie beating up the Enterprise in endless action sequences. Yep, exploration of ideas, cultures, and all that is, in a word, boring. Moreover, exploring strange new worlds and seeking out new civilizations, while fine for an hour a week over 24 episodes, is not what the general movie audience is looking for in a summer popcorn flick. They want to see stuff blow up. So, that’s what the studio gives us in Into Darkness, because that’s what you can do when you’re spending $200 million to make a movie. So out goes complex plot and in goes a script where the entire second half consists of action and damaging or destroying the Enterprise (and, oh, Lawdy, how I’m getting sick of that one). It’s a feedback loop: to be successful, the movie gives the audience largely what it expects, and the audience shows what it likes by buying tickets. So, forget the complex storyline and exploring brave new worlds. What about the characters? Could the film have done better? I’ll give the Abrams and crew credit: they did a particularly good job in re-casting the characters in Star Trek. It’s just a shame that they seem to have no idea how to write for those characters. In Into Darkness, the characters seem to be written more as simple character archetypes than people. Kirk is brash. Spock is cold and logical (or outrageously emotional). McCoy is, uh, southern. That sort of thing. Subtly is gone. Spock is the worst example: he’s either cold and logical or highly emotional; I never really got a feeling for the struggle between the two that is the core of the character. McCOY: But, dear Lord, do you think we’re intelligent enough to… Suppose, what if this thing were used where life already exists? McCOY: It’s new matrix? …Do you have you any idea what you’re saying? McCOY: Not anymore! Now we can do both at the same time! According to myth, the Earth was created in six days. Now, watch out! Here comes Genesis, we’ll do it for you in six minutes. Oddly, the ethical voice in the new Star Trek seems to have been moved from McCoy to Scotty, whose ethical dilemma at accepting unknown weapons onto the Enterprise ultimately leads to his dismissal from the Enterprise for much of the film. While Simon Pegg certainly pulls off the role, and brings a great deal of humor to it, there’s no re-creation of the triumvirate dynamic. Instead, we’re given a lot of bromance stuff between Kirk and Spock, which is fine but ultimately simplistic. Instead of an intellectual face off, we have the jock being tempered by the nerd. The intellectual relationships have been downgraded from college-classroom discussion to jock-vs-nerd debate. As is probably no longer a secret, Into Darkness lifts an enormous amount from Star Trek II. I’m not always sure it works. Khan is the primary example. Don’t get me wrong: I loved watching Cumberbach chew through the scenery. 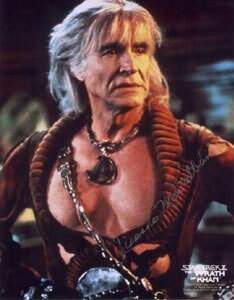 Ultimately, though, his Khan doesn’t have the same weight as Montalban’s in Star Trek II. It’s a matter of character history: the new Khan is defending his people, the old Khan is defending his people AND avenging the death of his wife, the blame for which he places squarely on Kirk’s shoulders (with the added benefit of having had 20 years to stew on it). The new Khan doesn’t like Kirk because he represents the Federation. The old Khan hated Kirk, and it was personal. A few scenes and bits of dialog were repeated from Star Trek II, in some cases directly and in some cases inverted. I think I know what the writers were going for, but I still had a difficult time buying the emotional resonance the scenes were supposed to have. The difference, again, is the lack of history between characters, a history which doesn’t exist in the new Star Trek universe. This group hasn’t yet gone on its five year mission, yet they’re repeating dialog and ostensibly experiencing the same emotions as the group in the other timeline who spent 30 years working together in the depths of space. It doesn’t ring true. What give the scenes gravity at the end of Star Trek II is that history: that there was a depth to the friendship between Kirk and Spock that had been forged over time. It’s what made the sense of loss palpable. These re-imagined characters, within the time frame established in the new timeline, have only been together a short while. Certainly bonds can be formed over short, intense periods. Strong bonds, even. But the point where working relationships cross to friendships that cross to family, perhaps something even deeper than family, take time. Women characters, I think, have suffered. Don’t get me wrong, both Zoe Saldana and Alice Eve are talented actresses, and have a couple of interesting scenes (particularly Saldana’s Uhura vs. the Klingons). Ultimately, though, they’ve come off as weaker than in previous TV series. The first weakness is visual. Have we really come all the way back from Captain Janeway to the era of miniskirts? One of my biggest gripes about the revamped Star Trek is the return of the skimpy 60’s mini-dresses. 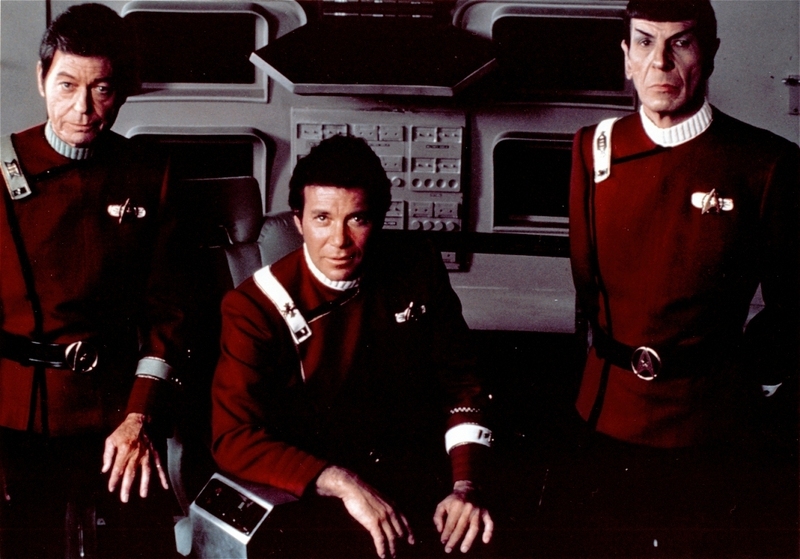 One of the best changes that happened when Star Trek went to the cinema was in Star Trek II, when Robert Fletcher revamped the costumes to look more like true military uniforms and worn by both genders. As for Eve’s character, Carol Marcus, for the life of me I’m still trying to figure out exactly why it was that her expository dialogue scene had to be delivered while she was changing clothes. In a scene that had no real reason for being staged as it was, and which ended abruptly, not even leading to a “Kirk gets the girl” scene. Is that Starfleet regulation-issue matching underwear? One of the things I found myself missing in Abrams’ Star Trek is the slowness of things. Visual effects can do anything now, and that works great in Star Wars films, where little ships fly and fight quickly. The Enterprise, though, isn’t small. It’s a big cruiser holding hundreds of people Which is why it’s a shame that Abrams has it moving as though it was an F-18. This might seem like an extremely geeky complaint, but the fact is it took me out of the narrative. Even in fictional worlds, I wouldn’t expect a Star Destroyer to turn on a dime, nor would I expect an aircraft carrier to in the real world. Fiction or no, the mind has a definite sense of how massive things are and, as a result, how they should move. Put simply: big things move slower. All the ships in Abrams universe seem to be able to move like X-Wings (such as the spin when the Enterprise is forced out of warp). Star Trek is starting to look exactly like Star Wars. Contrast this change with the Battle in the Mutara Nebula in Star Trek II,where director Nicholas Meyer created obstacles to slow the ships and blind the crew, making the “space” battle more on par with a slow, tense submarine warfare fight. The result was some beautiful, well-paced action. Those scenes had a sense of tension that I never felt in the action sequences in Into Darkness. Instead, Into Darkness, with phasers and torpedoes firing all over the place (even, somehow, at warp) and ships bouncing all over (why can’t they fly level at warp speed?) is a light show. Maybe Abrams was using this as his calling card for Star Wars, which he’s slated to take on next. The end of the movie comes with Kirk and crew setting off on their five year mission. For some reason, I find this odd… if this is going to be a three-film trilogy (as modern day three-picture contract deals tend to be), shouldn’t they have set off on their 5 year voyage a bit sooner? Like, say, at the end of the first film? Somehow it makes the film seem a bit superfluous. Make a big budget, crowd pleasing action picture, throw some reference bones to the die-hards, watch the dollars flow in. Maybe, in that, Paramount succeeded. Even if they have, the more I consider it, this Star Trek (and I refer, here, to the entire reboot, not just this film), is starting to feel like a Star Trek stripped down to its basic elements by the marketing department and recast in a way to ensure maximum profitability. In truth, of course, that’s exactly what movie studios, now part of larger interconnected corporate empires, are supposed to do. So I suppose I can’t really fault them for that. One of the things that I find most depressing, though, is that while the movie is fun, it’s not inspiring. It’s a slam-bang summer action flick. That’s all well and good, but unlike the series or even, perhaps, some of the earlier films, I don’t see this film inspiring the next generation of scientists, engineers, or explorers. Many in that group of people specifically cite Star Trek as having been their inspiration. (And previous Trek series have had science consultants, even though they were science fiction. I’m fairly sure such consultants were kept well away from the Into Darkness script.) Who knows? Maybe Star Trek II inspired some kid to start considering how to make a Genesis Device. Maybe Star Trek IV inspired someone to go into marine conservation and save the whales. I don’t know. Given his omnipresence in the marketing campaign over the last month, it’s probably more likely that Into Darkness will inspire kids who see it to try and be the next JJ Abrams. In the end, I still enjoyed the movie. It was a fun couple of hours. I’m not so sure. The parts are there, the cast is good, and they can obviously put together an exciting big-screen film. Moreover, all the things I’ve talked about, from complex plotting to character dynamics to effects scenes to getting rid of gratuitous T&A, ALL of them can be fixed. There will, of course, be a third film. With the 50th anniversary of Star Trek coming up in 2016, you can be damned sure Paramount will have a film in the theaters, come hell or high water. So I’ll keep my fingers crossed that the next film, somewhere on that 5-year mission, will be a little deeper, a little more character-driven, and a little better. Action and adventure, of course, but maybe a new world or a new civilization or two, just for kicks. PS – One thing that I absolutely DO love? Michael Giacchino‘s score. Brilliant beyond compare. Love love love this. You really hit the nail on the head with a lot of this criticism. Thank you for articulating the problem I had with the new Enterprise moving like an “F-18,” I’m really missing the slower strategic starship battles of the original films and series. I’m going to get in and out with some quick thoughts while I have time. Like you, I had super fun with the movie despite its flaws. 1) Kudos to the “Nah. Let’s spend the second half of the movie beating up the Enterprise in endless action sequences.” line. For me, the movie climaxed with Spock outsmarting Khan– which I LOVED (reminded me of twists from Asimov’s Foundation). After that, it felt like pandering to the action movie audience, giving them what they wanted. 3) Finally– I laughed out loud at many of your lines! I think “(with tails because, you know, sci-fi)” is probably the one that got me the most. Love this post– sorry I don’t have time for a longer comment! I wholeheartedly agree with you review, by the way. It was fun, but it could’a been more, ya know? Okay, I watched the movie. As someone who has no prior experience with Star Treks other than JJA’s first movie, I must say, while I understand where your criticism is coming from, I love it! Sure, it’s a popcorn movie, but a damn good one, and as you pointed out, a big screen just doesn’t have the time and space for the kind of cerebral/intellectual exploration of characters, history, and social-political-moral issues that can be done over a much longer period of time in a TV show (wow, that must have been one of the longest sentences I’ve ever written!) For what it is, it’s one of the better ones. Let’s just say that I enjoyed both ST movies, but can’t say I really care much for any of the rebooted Star Wars ones. That’s the thing, I did enjoy it as a popcorn movie. I guess the thing is, given the long history and creativity backing up the franchise, the movie could’a been more. It could have been more creative, more character driven, taken more chances. Instead, it felt safely designed to make as much money as possible (and, ironically, it hasn’t been as good at doing that as Paramount wanted anyway). In the Original Series, there were only 12 or 13 like the Enterprise(Constitution Class) and one could lay waste to a planet. So sad to see the movies and series that came after the original get it wrong.